At least one person has been killed in clashes between presidential guards and soldiers in Yemen's capital, Sanaa, officials and medics have said. Hundreds of members of the now-dissolved Republican Guard gathered on a square near the presidential palace to complain about their treatment. Shots were fired when the soldiers reportedly marched towards the palace. 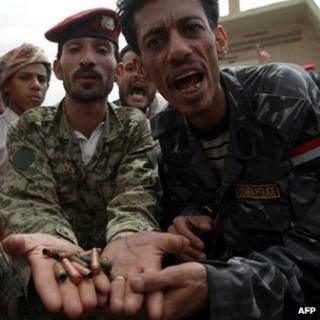 The ex-Republican Guard troops are believed to be loyal to Yemen's ousted former president, Ali Abdullah Saleh. The elite force was run by Mr Saleh's powerful son Ahmed until President Abdrabbuh Mansour Hadi abolished it last year in a bid to strengthen his control of the armed forces. Mr Saleh handed over power to Mr Hadi, his former deputy, in November 2011 as part of a deal brokered by Gulf states after a popular uprising. One report said the soldiers who protested on Friday in al-Sabin Square, a parade ground north-west of the presidential palace, were demanding that the ministry of finance pay them a bonus for the Islamic holy month of Ramadan. Another report said they wanted compensation. When shots were fired between them and the Presidential Guard, which is loyal to Mr Hadi, at least one soldier was killed and six others were wounded. It is not clear which side the casualties were on. The clashes reportedly ended when riot police and military police arrived. The violence comes as the British embassy in Sanaa announced that it would close for two days "due to increased security concerns". The US embassy in the capital is also closing for the day on Sunday, with the state department warning that al-Qaeda and related militant groups could be planning a wave of attacks in the Middle East and North Africa.